High Quality Content by WIKIPEDIA articles! The Main Line of the Pennsylvania Railroad was a rail line in the U.S. state of Pennsylvania, connecting Philadelphia with Pittsburgh via Harrisburg. 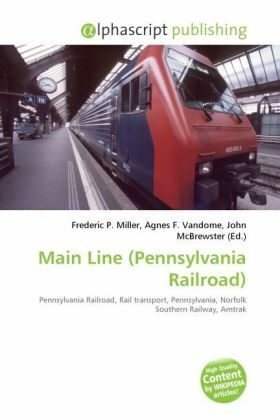 It is still an important cross-state corridor, composed of Amtrak's Philadelphia to Harrisburg Main Line, SEPTA's R5 Line and the Norfolk Southern Railway's Pittsburgh Line.The eastern part of the PRR's main line east of Lancaster was built by the Commonwealth of Pennsylvania as part of the Main Line of Public Works, a railroad and canal corridor across the state. The system consisted of the Philadelphia and Columbia Railroad from Philadelphia west to Columbia on the Susquehanna River, the Eastern Division Canal from Columbia to Duncan's Island, the Juniata Division Canal from Duncan's Island to Hollidaysburg, the Allegheny Portage Railroad from Hollidaysburg to Johnstown, and the Western Division Canal from Johnstown to the terminus in Pittsburgh. The Philadelphia and Columbia Railroad had one inclined plane at each end; the Allegheny Portage Railroad had ten.